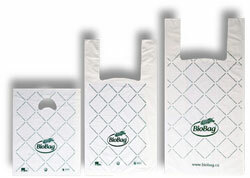 BioShop 30 Litre shopping bag. The 30 litre bag is the largest of our standard shopping bags. It is a great choice for environmentally friendly retailers and companies who wish to contribute to a better environment as well as enhance their environmental profile. They are not degradable or oxo-degradable bags which are chemically produced and are plastic blended bags. Our BioShop bags are made from renewable resources and are 100% biodegradable and certified compostable. An excellent choice for retail and supermarket chains, health-food stores, and other environmentally friendly companies who wish to contribute to a better environment as well as enhance their environmental profile- Ask for Ecolife Products BioBag BioShop shopping bags. Compared to paper bags, BioBag carrier bags constitute a better environmental solution as less energy is used to grow, transport and produce them. Custom printing using vegetable based inks available on larger quantity orders.